This book is about Claude Shannon’s information theory and related topics, from the elementary concept that the amount of information in any message or text can be measured in terms of the number of bits which are necessary to digitally store or send the message, and extending beyond that to issues of information complexity, randomness and many other topics. Our group gave the book an average rating of 4.9 on a scale of 0 to 10. Kirby started his comments by mentioning that this is the third or fourth book by Gleick that our book club has read, and that we have generally liked his writing style. With regard to this book, Kirby said he liked it up until chapter 12 on randomness. He followed Gleick’s points well up to that point. Kirby remarked that Gleick is really not a very good philosopher (a view that Scott seconded). But he regards the book as an excellent history of information theory and related topics. He thought the material on Charles Babbage was especially good. Kirby added that the book “must have held my interest since I read it all, but it didn’t knock me over. A lot of stuff we’ve read about before.” He felt that Gleick got a little carried away in the Epilogue, where “it seems he thinks he’s discovered the philosopher’s stone!” But overall Kirby says he’s glad he read the book. Ron agreed with Kirby’s comments, and also views the book as a good history of information theory. But he disliked the chapter about memes. Ron didn’t see the book as leading to any overall theory, and said that it is all too easy to take only certain themes and latch onto them. He felt that many of the later chapters of the book seemed like simply adding on various extra topics which were not all that closely related to any central subject. It didn’t seem to him that the book was working toward any overall point. Ron also pointed out that the book is rather Eurocentric, with little reference to things like Mayan or Chinese conceptions, for example. Forrest said that “I think I liked the book less than Kirby.” (Kirby & Ron gave the book a 6 on the scale of 0 to 10; Forrest decided to give it a 5.) He found it very dry. It seemed to him like two different books in one; a history and a technical exposition. Overall it seemed rather dreary. There were some nice stories he liked, though, such as the one about John Wheeler asking Gödel about the relationship of quantum mechanics to information theory (and Gödel’s failure to respond). Forrest also liked the discussion of Kolmogorov’s view of complexity as being measured by the smallest computer program that would produce that output. He also noted that Kolmogorov complexity doesn’t capture all the aspects of complexity, however. Rosie remarked “You guys stole all my thunder!” She felt this was Gleick’s worst book, though she did rate it a 6. She said the book did bring out Shannon’s information theory well. She enjoyed the discussion of data mining, and was impressed by Google’s predictions about the regions where flu was rapidly spreading based on the number of seaches for the term ‘flu’ from different areas. Kevin called the book “a slog”, and rated it just a 3. He said there were a few chapters he actually liked, but then the book got into Babbage. One more word about Babbage would have pushed him over the edge! Kevin thought the material on Turing was good. But in the end the book did not seem to make a cohesive whole. He didn’t know where it was going. Kevin does not consider the book a good read, and wouldn’t recommend it to anyone. 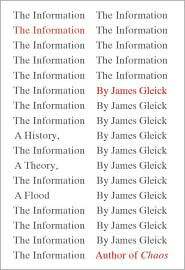 Although the core of Gleick’s book is Shannon’s theory of information, and he returned to Shannon from time to time, actually most of the book is about other topics. And the problem is that “information”, like knowledge, is such a broad general topic that almost anything can be considered part of it. As big as The Information is, it could have been indefinitely bigger if Gleick had decided to add many more chapters on, say, how information is stored in the brain, or on how electronic logic circuits can hold or transmit information, or on music and information, or on how scientific information is conveyed in journals, etc., etc. Moreover Scott feels that Gleick’s presentation of Shannon’s information theory itself is unsatisfactory in various respects. Gleick doesn’t make it completely clear until the Epilogue that from Shannon’s engineering point of view a totally false statement can have as much “information” in it as a true statement! In other words, in Shannon’s theory ‘information’ is a technical term, and does not mean information in the everyday sense! This should have been stated very early in the book, and frequently restated. Scott is compelled to complain about the frequent philosophical errors and confusions that Gleick makes, especially his infection (which is typical of our bourgeois era) with philosophical idealism. For example, on page 151 Gleick goes on at length to show how silly it was for people in the early days of the telegraph to imagine that some physical object was being sent through the telegraph wires. The ironic fact, however, that Gleick doesn’t seem to understand at all, is that every message must have a physical embodiment of some sort, can only be stored in one or another physical medium, and can only be transmitted from one place to another through the physical transfer of some material (either matter or energy) from one place to another. It is true that a written message on a piece of paper is itself not transmitted through the telegraph wires, but pulses of electricity are transmitted through those wires. The material form of the message may change, but at every stage there is one or another material form to it, and it can only be transmitted from one place to another by the physical movement of matter/energy. To not recognize this is to not even understand from a philosophical standpoint what a message actually is! Chapter 13 of the book is entitled “Information is Physical”, and yet even that chapter manages to convey the opposite impression. In particular, John Wheeler’s notion of “it from bit”, or in other words that the real world itself (“existence”) derives from “information” has it exactly backwards. It is a blatant example of philosophical idealism. By presenting such views uncritically, Gleick in effect endorses this same idealism. This brings out the fundamental fallacy of the entire field of science reporting as it is presently practiced. It only reports what others have claimed. Science, like every other subject, should be presented critically. And this means that it is best presented by scientists themselves, those who themselves have a thought-out point of view to defend, and not by mere “reporters”. Our guest Dawn did not give a numerical rating to the book, but she did make some comments on it. She said Gleick’s book reminded her in some ways of the book The Grand Design, by Stephen Hawking, which she had read recently. However, she remarked that if she had read a review of The Information beforehand she would not have decided to read it. But she not only did read the entire book, but afterwards went back and listened to a part of it in audio format. Nevertheless, while she enjoyed the first few chapters, she thought a lot of the material after that was extremely boring. Dawn said that she did learn a lot of technical history. One of the aspects of the book she particularly liked was the stories of cross-fertilization of ideas between biologists and physicists working together. Things like the concept of the Turing Machine were thought provoking, she said. Dawn was intrigued by the fact that Charles Babbage didn’t seem to have any definite profession. She agreed with Ron that the book was rather Eurocentric, but felt that this was somewhat understandably so in this case. But despite some interesting passages, Dawn didn’t feel the book was tightly written, and wouldn’t recommend it to others. Rich missed the meeting but sent in his brief comments. He rated the book a 5, and said he was disappointed because other Gleick books we’ve read were much better. There was some interesting history and biographies but overall the book was just fair. Rich had some doubts about the subject material as information is a very broad category and almost anything could be part of the story.